Alright! Its not the headache. It is actually quite difficult to wire wrap this tiny crystal. It just didn't want to sit still. I managed but its a bit "wai wai!" (off center)! 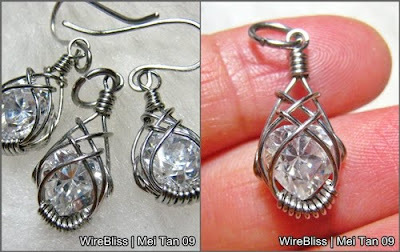 * Reminding myself not to wire wrap this kind of tiny crystal next time. Must be at least 1.5cm. Your right, wrapping tiny stones can be quite tricky, but I think your finished product here is absolutely beautiful! I have had a bit of luck wrapping small stones, but for the most part I stick to larger conversation pieces.